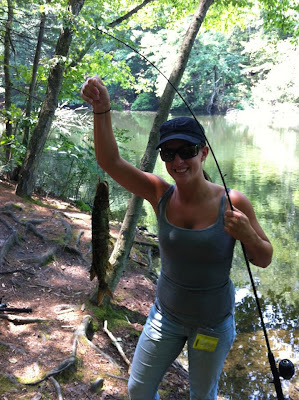 Ask Away Blog: Summer Bucket List: More Fishing! Well, this weekend we went to a BBQ and did some more fishing on Friday and Sunday. It was more of a laid back weekend, especially because it was a heat wave. I'm talking disgustingly sticky and gross even if you are in the shade. We went to Colonel Denning State Park on Friday but didn't catch anything. Sunday, we went to Laurel Lake and found this smaller pond. It's all part of Pine Grove Furnace State Park. There, I caught a huge monster. I'm not kidding. At first I thought it was a trout. It turns out it was a Muskie. It's creepy and it had teeth!! We put it in a cooler for a minute to get the hook out and then shut the cooler after it flipped out. So then when we opened it a few minutes later to try to ID it even closer it jumped out crazy style and flopped back into the lake. I was freaked out and had a nightmare about it last night. I can't believe people jump into the lake with a rope swing. ICKKKKYYYY when those type of fish are in there. AHH!! ewwwww! Give me a nice clean swimming pool!